I am loving this DELICIOUS Easter Crack White Chocolate Toffee Recipe and I wanted to share it with y'all today! This white chocolate toffee is amazing and the whole family will love them! 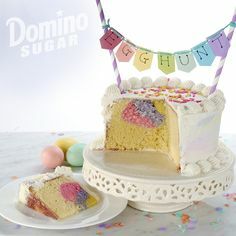 Easter Egg Hunt Cake | It’s an Easter egg hunt in a cake! This delicious surprise cake becomes an exciting game for the whole family as you cut into the cake, slice by slice, hunting for the colorful eggs baked inside. An ordinary chocolate sheet cake gets transformed into an Easter garden scene with this creative recipe that is brought to life with Peeps! Bright orange and green frosting makes the carrots pop in their chocolaty "dirt" rows, while crumbled Oreos give the garden a perfect dusting. A too-cute treat the kids will love to see at the Easter dessert spread! We present possibly the cutest, tastiest, most delightful thing you’ll bake this Easter. They’re easy to make too! Combine PHILADELPHIA Cream Cheese with BAKER’S ANGEL FLAKE Coconut for a cheesecake of unparalleled flavor. Top with speckled malted eggs to make a treat so irresistible, the Easter Bunny will be jealous. Wow guests at your Easter get-together with this impressive cake inspired by malted milk candy eggs. The beautiful blue frosting is speckled with chocolate and topped with a phyllo nest for a show-stopping layer cake that tastes of delicious vanilla. Expert tip: Kataifi can usually be found in the frozen grocery aisle with the ready-made pie crusts and puff pastry. 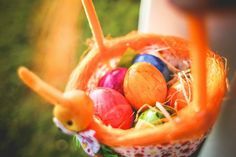 Get your Easter rolling with these delicious Easter Egg treats. Treat tip: Pour sprinkles or candies into the marshmallow-cereal mixture before stirring to ensure an even coating. Find more Easter treats at RiceKrispies.com. Take yourself back to your favorite dinner at home as a kid with Roche Bros.’ Broasted Drumsticks Dinner. Crispy chicken that’s not greasy made with a special stainless steel high-pressure fryer called a Broaster, this chicken dinner will bring you back and give your whole family something to remember. The high-pressure cooking method brings you chicken that is crispy on the outside and moist on the inside. It’s a complete meal with two broasted drumsticks served with your choice of any two side dishes, plus cornbread or a dinner roll. Enjoy! At Roche Bros., we are excited to bring you new, locally roasted, cold-brewed coffee from Atomic Roasters in Beverly! Since 1996, brothers Andrew a..
Sign up for our Roche Bros. newsletter to stay up-to-date on in-store events, recipes, special offers and more.